New to DIY-Investing? If so, then please browse around the site. You can navigate the DIY-Investors website by one of three methods; using the menu bar above, the Category (drop down menu) or the Search Box – both of which are on the right hand side of each page. Our community of DIY-Investors includes; beginners, intermediate and experienced private investors. We all share a common aim, which is to take control of our own financial future by managing our own stock market investments. Mick Pavey founded DIY-Investors several years ago – before the term was widely used. Since the financial crash of 2008, the move towards DIY-Investing has speeded up as people understand and appreciate the significant negative impact that fees paid to ‘professional’ fund managers and advisers has on our wealth. 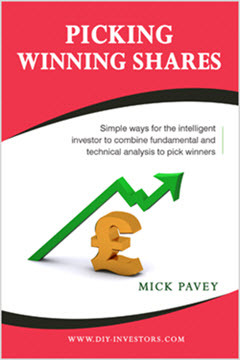 Here at DIY-Investors, we explain how to improve your DIY-Investing by using a combination of fundamental & technical analysis to pick winning shares. Want to check out some of our video content? The DIY-Investors YouTube Channel is HERE. DIY-Investors Facebook Page is HERE.